Follow the instructions carefully to complete the Altador Plot Part 14. 124. Take the stairs up to the Observatory , and click the 'Return to the Hall of Heroes' button. As you turn to head back down the stairs, your feet get tangled, and you trip and fall to the floor! You find yourself peering over the edge of the stairwell, down to the floor of the Hall of Heroes, far below. 125. Go and speak to the Lenny at the Archives . The archivist says, "Ah, the last constellation! Go and find it, I suppose. We may as well get this over with." 126. Go and see the Janitor . The janitor says, "I saw you almost fall out of the observatory! That reminds me, I've been thinking about closing the ceiling again. Our heating costs have gone way up, now that we have all this extra air to keep warm. We keep our boilers in the basement, y'see. I keep having to go down there and adjust the settings. It's a real pain and MAKES ME ANGRY!" He coughs. "Sorry. Been taking some medication to keep me calm. Anyway, if you want to go down to the basement and take a look, just let me know." Click on 'Visit the Basement'. 127. You need to go and see Finneus again. The archivist says, "Wait, I'm sorry, did you say there were only three stars you found in the clue? Well no wonder you can't find that constellation... three stars isn't enough for a constellation!" he scoffs. "You'll have to go find the other half of the constellation, I suppose. Hm, it probably isn't in the same place as the first half. That would be too easy." 128. Go to the Perfectly Flat Rock Quarry . Click on the rock circled below. One of the quarry workers blocks you as you try to step into the quarry. "Hey, you can't come in here! This quarry's for official business only!" The other quarry worker nudges him. "I think they want one of the rocks," he says. "Couldn't hurt, could it? Just a rock, not like we don't have a million of 'em here anyway." The first quarry worker grumps. "Fine, you can have a rock. But it'll cost ya -- 50 neopoints!" Click on 'Buy a rock for 50 NP'. You will actually need 50 NP on hand to pay for the rock! The quarry worker takes the 50 neopoints and hands you the rock. "Well, there you go. Don't know what you'd want a perfectly flat three-inch rock for, but..." He shrugs, which is a neat trick, considering JubJubs have no shoulders. 129. Go back and see the Janitor and visit the Basement. Click on one of the gears to jam them with the Rock, then click on it again to take it back. 130. Go back to the Rock Quarry . Click on the area behind the Jubjub, as below. Click the big rock in the corner and grab it while they aren’t looking. The quarry workers turn around at the noise of a rock being thrown into the quarry. "Hey, what was that?" one of them says, peering around curiously. Now, click the rock that you threw to pick it back up - it's behind the Jubjubs. The quarry workers turn back around. "Oh well, I guess it was nothing. Say, it sure does seem like there's fewer rocks in here than there used to be." 131. Go to the Herbology Club and ask the Quiggle if he can juggle. The Quiggle sniffles a little, despairing over his situation. "This Herbalism Club was a terrible idea. No one wants to learn about plants or flowers! Maybe I should have stayed in the circus." The Quiggle spends a few hours showing you the basic skill of juggling three similarly-sized objects. It's an arduous process, filled with hope and despair, dizzying highs and crushing lows. But eventually, you master the art of keeping three beanbags in the air, and the Quiggle pats you on the back. "I'm so glad I was able to pass on this knowledge. Finally, my legacy will continue." He stops for a second, then scowls at you. "Now GET OUT! I've got to go back to being arrogant." 132. Return to the Quarry and click on either Jubjub. The quarry workers look at you as you approach. "Bored? Yeah, I guess we are kinda bored. We've been having the same argument for months. Can't think of anything new to talk about. I guess that's what can happen when you're surrounded by square rocks all day. They're not interesting at all." He perks up as you explain your request. "You want to show us your juggling skills, eh? Well, it looks like you've only got two rocks there. That's hardly a challenge to juggle!" "Well, yes, obviously," says the first one. "But if you had three rocks to juggle, now that would be something." The quarry workers cheer as you demonstrate your juggling ability. "Wow, that's the most fun I've had at work since I started here!" says one. "You bet," says the other. "This is quite possibly the greatest day of my entire life." He sniffles, holding back tears. 133. You have 3 rocks by now (they are NOT in your inventory). Go to the Basement - you'll now be able to use your rocks to jam up the gears. To lay a rock in a gear and jam it up, just click on it. You need to jam up three correct gears (out of the ten available). To do this, lay the rocks and go back to the Janitor. Click the button he has next to him to adjust the ceiling. Clicking the button will automatically show you the view from the ceiling. You will know you have the right gears when the ceiling looks like the following and the circled bits are clickable. The simplest way to do this is to jam the gears one at a time and then press the button to close the ceiling. If the left side of the ceiling moves, remove that rock automatically. If the right side of the ceiling moves, count the number of visible tick marks on the edge of the circle. If there are 4, 5, or 6 tick marks leave the rock there. If there are any other number of tick marks, remove the rock from that gear. Keep track of how many ticks over the ceiling will be from the rocks you’ve found and count from there when testing new rocks. If you do it right, you should be able to find the correct combination without even having to count the marks for the final rock! NOTE: If you haven't jammed up the correct gears after 10 tries, the janitor will get angry and reset everything. Sometimes this can be very troublesome, but you should be all right if you're using the method mentioned above. We also have an in-depth Gear Guide for you (in case you still don't get it). 134. Time to plot the new constellation, the Hunter! Get your constellation's position here. Then, plot it at your telescope ! 135. The Janitor is very angry! The janitor shouts, "WHAT?! After all that, I don't even get to see the ceiling all lit up pretty? NONSENSE!! This is ridiculous! I demand reparations! I demand satisfaction! Something must be done! ARRRGHH!!" He starts running around in circles, frothing at the mouth and growling incomprehensibly. 136. The Astronomy Club is extremely grateful to you! 137. Finally, see Finneus . The archivist says, "At long, long last, King Altador, the Hunter. You have found a constellation for each of the twelve Heroes of Altador... and all twelve of the constellation gems in the ceiling of the Hall of Heroes would be alight, except that the magical source of their lighting has been shut off." "However, the Book of Ages has revealed another chapter. I believe that the Book contains a weak magical power source, which reveals a chapter each time a constellation is found. I think I failed to sense it before because the other two enchantments, being so much more powerful, drowned it out. Alas, the magic in the Book of Ages does not seem to be connected to anything else, so it is of no use to us in unraveling this mystery." He sits at his table, shuffles through some papers. "And now we wait. The history-hiding enchantment is very strong, and will probably take some time to wear off. We should slowly begin to regain our memories of past history as it decays." 138. The Book of Ages has been updated. Read it, and go to page 53. Click on the Faerie’s hands at the bottom of the page. Click on 'Return to Archivists Office'. The archivist says, "Strange, I'd overlooked that drawing of the Dar--" He hesitates for a moment, and gathers his composure. "The Betrayer. But you think it means something, you say? But what?" He plops into his chair and rests his chin on his hand. "The fire in her hands... well, it's practically her trademark. And the picture does resemble her statue in the Hall of Heroes. Except on the statue, the flames are stone, just like the rest of it. Perhaps there's some way to bring the stone to life? There might be such a spell in the Archives somewhere, but the cataloguing system doesn't go into detail about specific spells, just the titles of books." He shakes his head. "Of course, there are thousands of spellbooks in there... tens or hundreds of thousands, perhaps. I wouldn't know where to begin to find the proper spell. Finding the coordinates for the correct room, just searching randomly, would be... madness of some kind." 139. Return to the Archives main hall, and enter the Library by clicking on the Handle on the left-hand door. 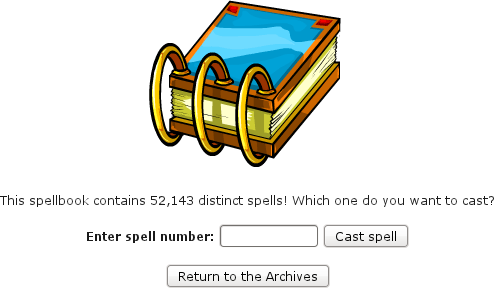 You now need to search for the Spellbook, below! To get the spellbook, find the coordinates for your Sleeper constellation and then input the values in our Spellbook finder. 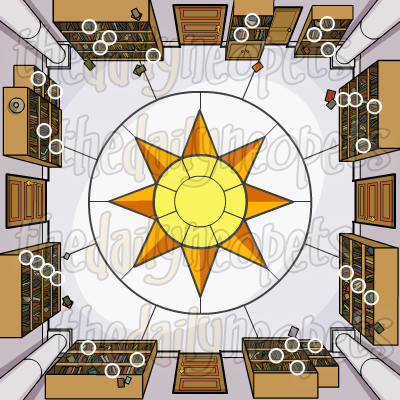 Our finder will tell you the coordinates of the room where you can find your spellbook. Then, all you have to do is to enter into the library and click on any of the doors. Look at the URL of the page and insert the X and Y coordinates of the room you want to visit in the appropriate spots (as demonstrated by the example below). Remember, in order to find the correct room, you have to use your own URL with your own coordinates. As we already mentioned only a few lines up the page, this URL is only an example, it's meant to show you where you need to put your coordinates. Everyone's URL is unique. Credit to Liz for finding the method. Your pants disappear! Good thing you're alone. You grow to ten times of one-tenth your normal size! The lights go out for a moment, then flicker back to life. A horrible stench fills the room, and just as quickly vanishes. The temperature in the room drops by forty degrees. The room shakes, then all goes still. You suddenly feel very dizzy. Your skin cycles through a dozen random shades before settling back down to its normal colour. A thick cloud of dust appears from nowhere, sending you into a coughing fit. The stone beneath your feet turns to mud. Suddenly, everything appears upside-down to you. A mystical howling echoes in the distance. The ghost of King Coltzan flies through the room! A loud thumping sound reverberates through the halls. Your hair catches on fire! A tiny storm cloud forms in the center of the room and rains for a few seconds. Your personal gravity field suddenly reverses, and you find yourself standing on the ceiling for a few seconds, before crashing back to the floor. Lightning bolts shoot out from the walls! You barely avoid being incinerated. A confused-looking Kadoatie appears out of thin air, then suddenly vanishes. Click here to continue on to Part 15- the final part!- of the Altador Plot. The Snowager is awake. He'll be sleeping in 1 minute, 34 seconds.